New illustrations of children, animals and other fun things. An illustrated book cover for a book called “Something Magic” about a young girl and her superpowers. Scaryanne, a story about a girl who is courageous and a little crazy. She shakes up the town of Landfill. Show and tell, or should I say “show and smell”. Scaryanne brings her pet scunk Doris to school. Aunt Kitty, always surrounded by cats and she tried to get her knitting done before the holidays. 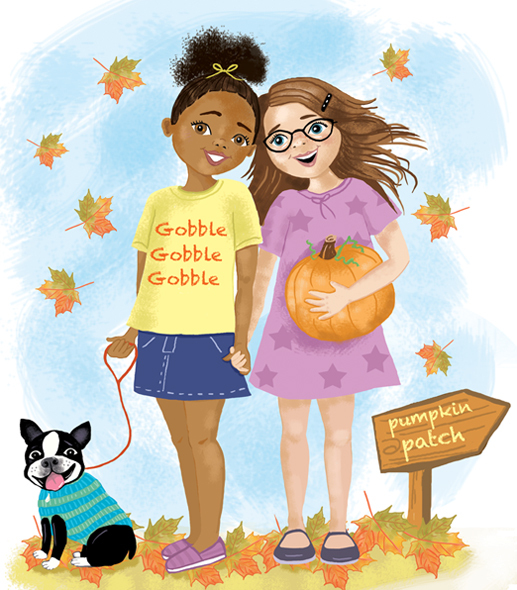 A cute book series about a girl, her friends, and their adventures with animals. A book I worked on about teaching manners to children. These cute kids were fun to draw and bring to life in the story. The children learn how to behave at a restaurant. Even when others aren’t. Full bellies and all went well. It’s time to go home and relax. Sometimes it’s good to feel like your own super hero! Follow Harlow and her little dog dixie as they search for true happiness. Fairy friends! Harlow and her cute group of fairy friends learn what true friendship is all about.